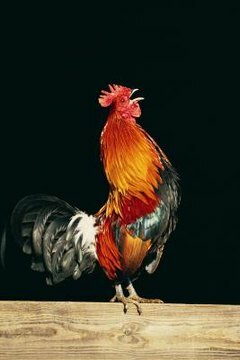 A rooster who is crowing in the middle of the night can make it difficult for everyone else to sleep. If your rooster's vocalizations are keeping you awake through the night, you may need to carefully inventory his environment and make changes so he'll spend more nighttime hours sleeping and less time crowing. Most rooster owners expect their roosters to begin crowing as dawn approaches. The sky will begin to lighten long before the sun actually rises -- it's normal for your rooster to start crowing as early as two hours before the sun comes up. This means that if the sun comes up at 6 a.m., then your rooster may decide to start crowing at around 4 o'clock in the morning because he senses dawn approaching. Your rooster may mistake a bright light for dawn and start crowing because he thinks dawn is coming, even though sunrise is many hours away. If the light is constantly on at night -- for example, a streetlight -- then your rooster may well crow all night. Artificial sources of light may confuse your rooster and prompt him to crow at all hours. If you think your rooster is crowing because of artificial lights, try turning out all of the lights or using a curtain or cover to prevent your rooster from seeing the light. See if that helps him stay quiet when you are trying to sleep. Roosters naturally protect their hens. One of the ways roosters do this is by alerting the hens when potential threats are approaching. Crowing serves the purpose of alerting the hens to seek cover from a predator and alerting the predator that a rooster is guarding his flock. Predators in the night, or even just perceived predators in the night, will cause a rooster to crow. Roosters can, and do, crow whenever they feel like it. Your rooster may crow because another rooster crows. He may crow to communicate with the hens or other animals around him. Some roosters are more vocal than others. If you have a rooster that simply enjoys crowing in the middle of the night or just feels the urge to do so sometimes, there is little you can do to prevent the behavior from occurring.